Sinusitis is an inflammation of the nasal sinuses. Under normal circumstances, the sinuses produce a small amount of mucus. However, when inflammation sets in, the mucosal lining substantially increases mucus production. Inflammation is usually caused by bacterial, fungal, viral or allergic processes. The inflammation of the nasal sinuses leads to swelling of the sinus mucosa, resulting in blockage of the sinus drainage. Thus, the pus cannot escape into the nose and builds up pressure inside the sinus cavities, causing increased inflammation. This creates a vicious cycle of increasing inflammation and obstruction of the drainage pathways. Chronic Sinusitis. If untreated, sinusitis may develop into a chronic condition. Acute Asthma. Sinusitis can trigger an asthma exacerbation. Meningitis. The infection can spread to the lining of the brain. Vision Problems. Reduced vision or blindness may occur if infection spreads to the eyes. Aneurysms or Blood Clots. The infection can cause problems in the veins surrounding the sinuses, interfering with blood supply to the brain. Dr. Zadeh is a fantastic physician. I have gone to him for a couple of years now for sinus congestion, sinus infection, allergies, and sinusitis. He is a great diagnostician and is able to analyze your symptoms to accurately diagnose what is the problem. He is conservative in his treatment approach doing only what is necessary while informing you of what will be the next step if symptoms get better or not. He may prescribe antibiotics or nasal sprays or nothing at all, depending on the symptoms and his exam. He spends a lot of time with you and you will not feel rushed. He answers all your questions comprehensively. He is genuinely caring. It comes across in his sweet bedside manner and he takes your concerns seriously. He is very gentle when it comes to the exam or using a scope to see what is going on. His staff is very nice and organized. It is also very easy to communicate with the billing department. The office is newly updated with clean interiors and elegant design. He is out of network for me, but I still go to him because he is awesome. I highly recommend him, and now my wife goes to Dr. Zadeh and my mother-in-law too! Be ready for the way medical care used to be, excellent customer service and patient care, combined with cutting edge technology and the latest advancements in the field. Nasal Endoscopy. A thin, flexible fiber-optic tube with light and camera at its tip (endoscope) is inserted through the nose, allowing for visual inspection of the sinuses. This is generally a painless procedure which takes a few minutes to complete. CT Scan. Images taken using computerized tomography (CT) show details of the sinuses and nasal anatomy. A CT scan is used to define the anatomy, extent of the disease, and response of the treatment course. CT scans also help identify inflammation or physical obstruction that may be difficult to detect using an endoscope. Nasal and Sinus Cultures. In general, laboratory tests are not necessary for diagnosing sinusitis. However, when medical therapy fails, tissue cultures may help identify the bacterial pathogen. Allergy Testing. If the condition is caused by or exacerbated by allergies, an allergy skin test may be recommended. Allergy testing is a safe and effective method to help diagnose the allergens responsible for the sinus flare-ups. Reduce risk of upper respiratory infections. Minimize contact with people who have colds. Wash hands frequently with soap and water,especially before your meals. Avoid cigarette smoke. Tobacco smoke can irritate and inflame the nasal passages. Use a humidifier. If the air in your home is dry, adding moisture to the air may help prevent sinusitis. Be sure the humidifier isclean and free of mold. Limit alcohol consumption. Drinking alcohol can cause sinus passages to swell. Maxillary Sinusitis – can cause pain or pressure in the cheek and upper teeth area. Ethmoid Sinusitis – can cause pain or pressure between and/or behind eyes. Frontal Sinusitis – can cause pain or pressure above the eyes and in the forehead. 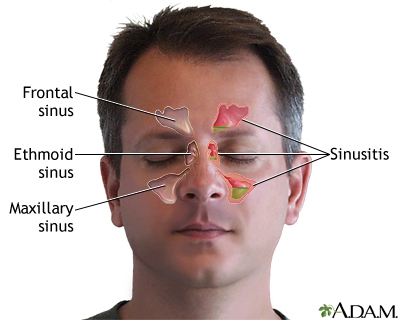 Sphenoid Sinusitis – can cause pain or pressure behind the eyes, in the temple, or even the crown of the head. An acute sinus infection is a sinus infection that lasts two to four weeks and generally responds well to medical therapy. Acute sinusitis is usually precipitated by an earlier upper respiratory tract infection, generally of viral origin. Acute sinusitis may also follow the inflammation associated with an allergy attack or environmental irritants. The inflammation creates swelling which obstructs the sinus openings and prevents mucus from draining normally. This creates a moist environment conducive to infection. Virally damaged sinus tissues are colonized and then infected by virus or bacteria. The virus or bacteria become trapped by swelling in the nose and narrow sinus passages. The trapped virus or bacteria then begin to multiply, causing acute sinusitis. Acute episodes of sinusitis can also result from fungal infections. These fungal infections are most often seen in patients with diabetes or other immune deficiencies. Clinically, it is difficult to distinguish between bacterial and viral acute sinusitis. However, in general, disease duration of less than 7 days is considered as viral whereas disease duration of more than 7 days is considered as bacterial sinusitis. Often, acute sinusitis will subside without the need for antibiotics. Self-care techniques as outlined below may speed the recovery process. The choice of medications is based on the patient’s medical condition and disease state. Antibiotics. Antibiotics are chosen based on culture results and/or medical judgment. Rest and Hydration. The more rest and sleep the better; this allows the body to heal itself faster. Increasing water consumption is very important since a lot of fluid is lost during an infection. Hydration makes the mucus flow more freely and helps with relieving the congestion. Nutrition. Good nutrition is essential for resisting and recovering from an infection. It is important to eat a well balanced diet. Consume the recommended dietary allowances for vitamin A, vitamin B complex (vitamins B-1, B-2, B-5, B-6, folic acid) and vitamin C, as well as the minerals zinc and copper. If the diet does not provide an adequate amount of these vitamins and minerals, supplements should be added as needed. Pain Relievers. These are effective in reducing sore throat and headaches. It is important to read the instructions carefully and to stay within the recommended doses. Aspirin should never be given to children as it has been associated with Reye’s syndrome, a rare but potentially fatal illness. Gargling with salt water (1/2 teaspoon of salt in 1 cup of water) is effective in reducing a sore throat. Saline Nasal Sprays. Over-the-counter saline nasal sprays help reduce nasal congestion. They are effective, safe and nonirritating. Saline nasal sprays provide moisture to the nasal passages, especially during cold or dry seasons. When the nasal passages are dry, stagnation of mucus and mild nasal crusting may occur. Bacterial infections can develop under these crusts. Saline sprays clean the nasal passages of crusts and mucus and also help the natural cleaning system of the nasal passages. Decongestants. Decongestants fight nasal congestion by temporarily constricting the blood vessels. By reducing the size of the blood vessels, the nasal mucosal swelling, and therefore the nasal and sinus congestion are reduced. Decongestants are available in pill form as well as nasal sprays. Please be aware that over-the-counter nasal decongestant sprays can cause a “rebound effect” when used longer than the recommended period. This results in worsening of the nasal congestion after the medication has been stopped. In addition, decongestant pills may increase blood pressure and heart rate. Decongestants should not be taken without first checking with a physician if the patient has heart disease, high blood pressure, prostate problems, diabetes, or thyroid problems. Inhaled Nasal Steroids. Inhaled nasal steroids, or corticosteroids, are inhaled nasal sprays that reduce nasal and sinus symptoms. They do not cause a “rebound effect.” They decrease the swelling in the nose and sinuses, thus reducing the congestion and allowing for drainage of the sinuses. Schedule a free consultation today with Dr. Mani Zedeh for arguably the best treatments for acute sinusitis Los Angeles has to offer. Subacute sinusitis generally lasts 4 to 12 weeks and usually resolves completely after an effective medical regimen. It is the natural progression of acute sinusitis, which may or may not have been treated, that has failed to resolve. In general, the symptoms are less severe than the symptoms of acute sinusitis. Although usually responsive to medical treatment similar to acute sinusitis, surgical options are considered when the symptoms fail to improve or worsen. In chronic sinusitis, the condition recurs or endures longer than 12 consecutive weeks. Chronic sinusitis is one of the most commonly diagnosed chronic illnesses in the United States, affecting 30 to 40 million Americans each year. Chronic sinusitis begins with an inflammation of the mucous membranes in the sinuses which prevents normal mucus drainage. Chronic sinusitis can significantly impair one’s quality of life. Patients commonly suffer from nasal obstruction, frequent headaches, and tenderness in the face or aching behind the eyes. In addition, there may be chronic yellow or greenish discharge from the nose or drainage down the back of the throat. Although chronic sinusitis is often caused by infections of the upper respiratory tract (nose, sinuses, and throat) there are also noninfectious triggers. Allergies, smoking, nasal polyps, mold and fungi can also be a factor. Abnormally narrow sinus passages, which can impede drainage from the sinus cavities, can also contribute. Recurrent bouts of sinusitis may result in increased inflammation of the nasal or sinus mucosa and each instance can potentially further narrow the sinus openings. Learn more about some of the best treatments for sinusitis Los Angeles has to offer and schedule a consultation with Dr. Mani Zadeh today. Antibiotics. Antibiotics are chosen based on culture results, extent of disease,and/or medical judgment. Decongestants. Decongestants fight nasal congestion by temporarily constricting the blood vessels. By reducing the size of the blood vessels, the nasal mucosal swelling, and therefore the nasal and sinus congestion are reduced. Decongestants are available in pill form as well as nasal sprays. Please be aware that over the counter nasal decongestant sprays can cause a “rebound effect” when used longer than the recommended period. This results in worsening of the nasal congestion after the medication has been stopped. In addition, decongestant pills may increase blood pressure and heart rate. Decongestants should not be taken without first checking with a physician if the patient has heart disease, high blood pressure, prostate problems, diabetes, or thyroid problems. Allergy Shots (Immunotherapy). If allergies are contributing to the chronic sinusitis, desensitization to the allergens may help alleviate the condition. The goal of allergy shots is to “train” the immune system over time to be better able to tolerate the allergens that trigger the symptoms. Allergy testing is used to help identify the specific allergens that are causing the reactions. Allergy shots contain small amounts of these allergens and are given on a regular schedule so that the body gets used to the allergens and no longer overreacts to them. Endoscopic Sinus Surgery. In cases that fail to respond to medication, endoscopic sinus surgery may be an option. Balloon Sinuplasty. Balloon sinuplasty offers the surgeon an additional tool for sinus surgery. This may be performed by itself or used in conjunction with endoscopic sinus surgery.